I recently went to visit my younger sister for a few days. I love going there! We always have a good time and she cooks some amazing gourmet meals (she's a chef)! 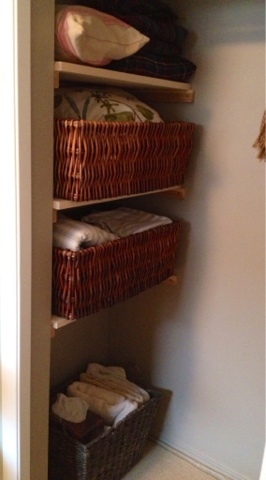 Anyway, she was badly in need of some extra storage in her guest room closet. She has the decorating gift, that one. Give her half an hour she'll work a miracle in a room. 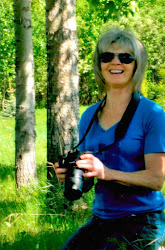 She decorates, quilts, sews, and did I mention she's an incredible cook? But the one thing she does not like to do is build. We were trying to find a way to organize her guest room closet. There's an upper shelf with a closet rod just under it and then an extra closet rod halfway down that totally gets in the way. She's been hanging shorter clothes and throws on it. At one end is a tiny recessed spot. I said, "You know Carol, some little shelves would be a good place to store those throws. Plus all the pillows that are sitting up on that high shelf. And then we could yank the lower closet rod right out of there!" Sorry, they're just iPhone pictures. We headed into the garage and found some 1x2's to use for shelf supports. 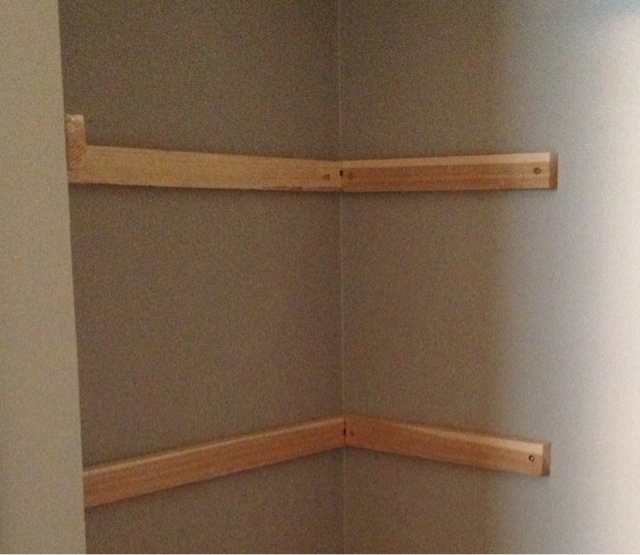 I just cut pieces to length and fastened them to the wall with deck screws we found in her garage. You can see one of the throws on the right, hanging on the closet rod. 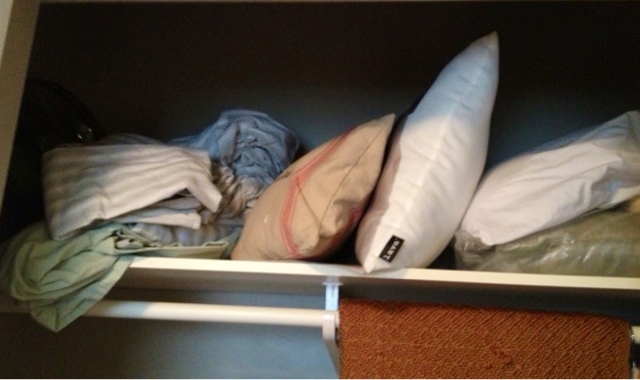 And the upper shelf crammed with pillows and sheets and stuff. She bought a 1"x12" shelf board for $20 and the guy at the lumber yard cut it for us. I secured the shelves with a few finish nails through the top into the supports. 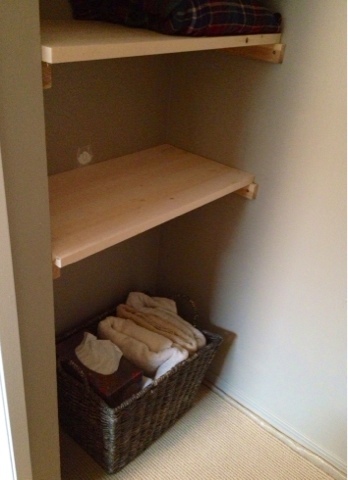 That spot of wood filler above the bottom shelf is where the lower closet rod used to be. She found a few baskets in the basement and voila! Storage! Everything that was on the upper shelf fit in here. She's pretty happy! And now there's a place to put her nesting tables and sofa bed cushions when she has an overnight guest, like her sister! Sounds like you guys are a great team! This looks very nice and seems like a very simple project!